Staining log homes takes a lot of work! The key to a successful job is how well you clean it first. 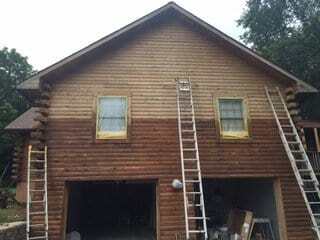 Quite often when we are asked to stain a log home it is well overdue and in dire need of attention. Power washing and getting it ready to go takes a lot of effort. It is important to use chemicals in combination with the power washing. One of the best cleaners for this process is DeckBrite. We normally use 2 to 3 of the large 3lbs containers on a log home. Technically that’s 22 gallons of cleaning solution, but we actually double up on the mixing ratio a bit so it makes less then that. When using DeckBrite the best way to mix it is in a five gallon bucket and when ready transfer it to a Hudson sprayer. Don’t mix it in the Hudson sprayer. The sprayers almost always get clogged if you do that. When the granules are mixed with water, the water turns blue. When the water looses the blue appearance you are ready to use it. We like to mist the cabin logs with water and then hit it with the DeckBrite. Working in sections starting at the bottom works best. The cleaner should remain wet and given time to work, then hit it with direct spray at a relatively close angle to the logs. You will see the color and dirt being stripped away with the force of the water. You need to be fairly close to the logs with the spray pattern for it to work. This means ladders and power washing which is not the best combination for safety sake. This is a job perhaps best left for the professional paint contractor and it is a process that takes time. Adequate dry time is important. When it is good and dry after power washing, it’s time to stain. When staining a log home I like to use Sikkens stain. It is expensive but you will get many years out of this product. Using an airless sprayer and low pressure works well. Back brushing and working the stain into the logs is a must!